John L. Wright, the founder of Wright Tree Service, got a taste of tree trimming when he got a job with National Tree Company in 1928. When the company went out of business in 1930 due to the Great Depression, John took a part-time job as a mail carrier at 60 cents an hour and did tree work in his spare time. In 1933, when the post office decided to cut his hours to four per day, John decided to make a change. He packed his suitcases, loaded a few tools worth about $20 into his secondhand car and, accompanied by his wife Harriet, took off for Cedar Rapids, Iowa. And so began Wright Tree Service. Although total sales for the first year were only $600, John and Harriet managed to eat most of the time. Work shut down altogether when winter arrived, and the couple spent the time in Des Moines, Iowa, visiting relatives. In the spring of 1934, John decided to stay in Des Moines, and the home office of Wright Tree Service has been there ever since. The early years were extremely difficult, but work picked up in the spring of 1936, and John purchased an ad in the phone book for the first time. John also supplemented his income as a railway mail clerk because now he and Harriet had a family to support. The business turned the corner in 1938, and John was able to quit his part-time job. 1940 was a significant year. Wright Tree Service received its first line-clearing job from a utility, Iowa Power and Light Company. That company is now MidAmerican Energy and is still a customer today. World War II made it very difficult to maintain a steady work force, so 1945 was a welcome year with rumblings that the war might soon be over. By 1947, business had grown, and districts were formed. The company had also purchased its first chain saws and, although bulky and heavy, they were a tremendous improvement over the cross-cut saws. 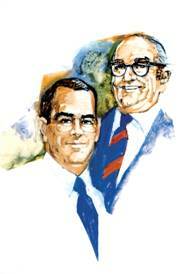 Upon John’s untimely death at age 59 in October 2002, Scott Packard became President and CEO. Under Scott’s leadership, Wright Tree Service has expanded its service area even further. In 2008, Wilbur Nutter was appointed President/COO, and Scott continued as Chairman/CEO. Today John L. Wright would be justifiably proud of the company he started with a one-man crew and a bookkeeper who was his wife. The John Wright Memorial Scholarship Fund was established in 2008 to create a substantial scholarship fund to help college students interested in commercial arboriculture achieve high academic goals and support the arboriculture industry. The intent of this award is to enable students to attend college without accumulating burdensome debt. The $2,000 John Wright Memorial Scholarship will be awarded at the TREE Fund’s summer Board of Trustees meeting. The scholarship recipient will be notified by e-mail and letter. The award is non-renewable, but can be applied for annually. All awards will be paid directly to the recipient’s educational institution, in two equal payments. Proof of attendance and minimum GPA will be required prior to second payment. High school seniors entering college or community college, and returning college students attending accredited U.S. colleges or universities are eligible to apply. Awards may only be used for undergraduate study and are limited to those seeking a first bachelor’s degree or associate’s degree and plan to enter the arboriculture industry. In making grants, the Tree Research and Education Endowment Fund (TREE Fund) does not discriminate on the basis of race, color, creed, gender, sexual orientation, handicap or national or ethnic origin. Trustees of the TREE Fund or any member of the family of any such Trustees are ineligible to receive grants from the TREE Fund.